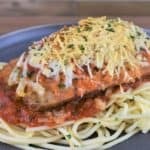 Italian Sausage Parmigiana, for this dish, flavorful Italian sausage is topped with pasta sauce, mozzarella and Parmesan cheeses and crunchy breadcrumbs. Then it’s served on top of a bed of pasta, for a fun take on traditional Parmigiana. 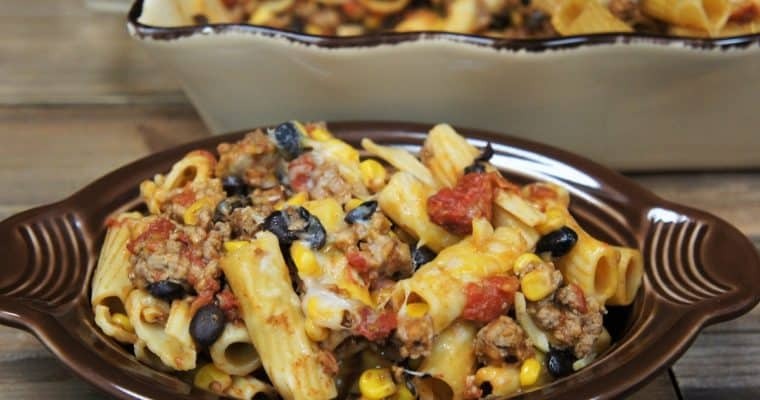 Since it comes together quickly and easily this delicious dinner is perfect for hectic weeknights. 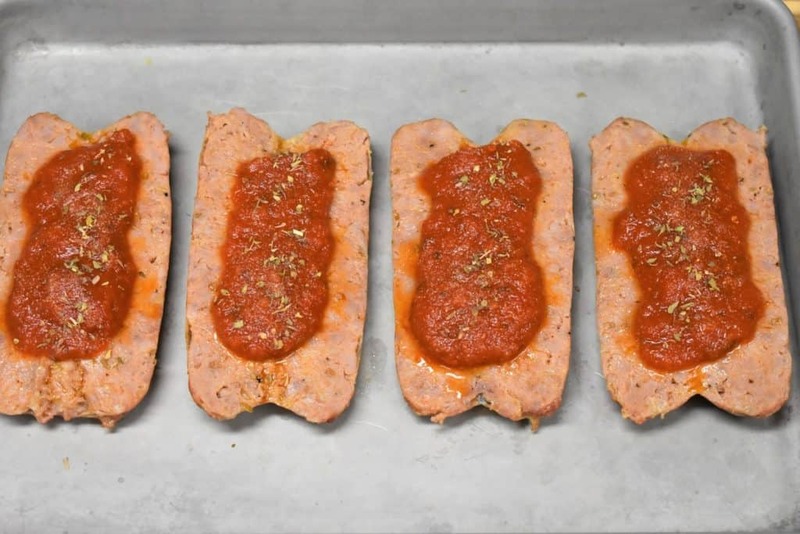 If you’re in the mood for more great Italian sausage recipes try Italian sausage meatballs, Italian sausage & pastina soup, or these delicious Italian sausage meatball subs. Enjoy! Heat the oil in a large skillet over medium to medium-high heat. Add the Italian sausage to the skillet. Cook for 4-5 minutes, turning to brown on all sides. Carefully add 1 cup of water to the skillet, lower the heat to medium-low and cover. Cook the sausage for approximately 15-20 minutes or until the internal temperature of the Italian sausage is at least 165°F. Give the pan a quick shake every once in a while, or turn the sausage to make sure they don’t burn. Allow the sausage to cool on a plate or cutting board. In the meantime, preheat the oven to 350°F, and start a large pot of water on high heat for the pasta. When the Italian sausage is cool enough to handle, butterfly each piece. Cut the sausage in half, lengthwise, without going all the way through. 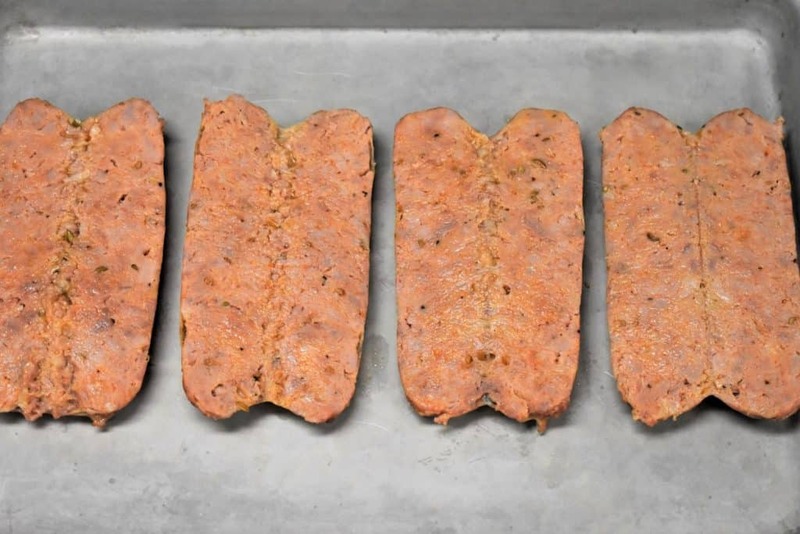 Open the sausage so it lays flat on a baking sheet. ​Spoon about 1 tbsp. of the pasta sauce over each sausage. 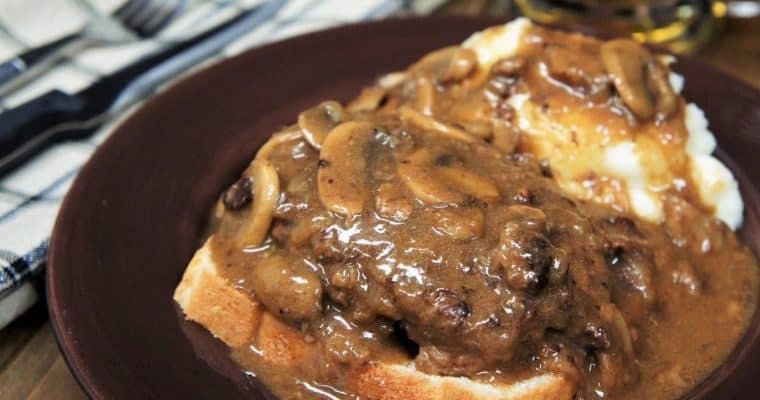 ​Sprinkle the sauce with the garlic powder and dried oregano. ​Add the mozzarella cheese (about 1½ – 2 tbsp. for each sausage). Then, top each sausage with 1-2 tbsp. of the crunchy panko breadcrumbs. Finally, sprinkle the top with a little Parmesan cheese. ​Once the Italian sausage parmigiana is prepped, drop the pasta into the boiling water. Make sure you add a generous amount of salt to the pot. Cook the pasta to package directions for al-dente. Now is a good time to warm the sauce for the pasta too. Place the sausage in the oven, bake for 15 minutes or so until the cheese is melted. If desired switch the oven to broil for a couple of minutes to toast the breadcrumbs and brown the cheese a bit. If you decide to do this, do not leave the oven’s side. 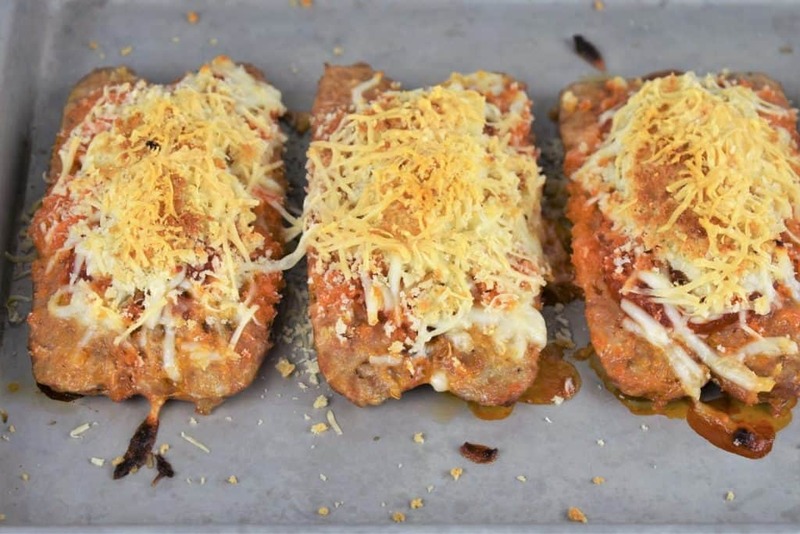 The Italian sausage parmigiana can go from beautifully golden to burnt in a minute! Switch the oven light on and stay put. As soon as the top is perfectly golden, remove the baking sheet from the oven. Garnish with the parsley, if desired. ​When the pasta is done, reserve about a ½ cup of pasta cooking water, drain the pasta and return it to the pot. Add the reserved pasta water to the spaghetti to prevent it from sticking, give it a good stir. 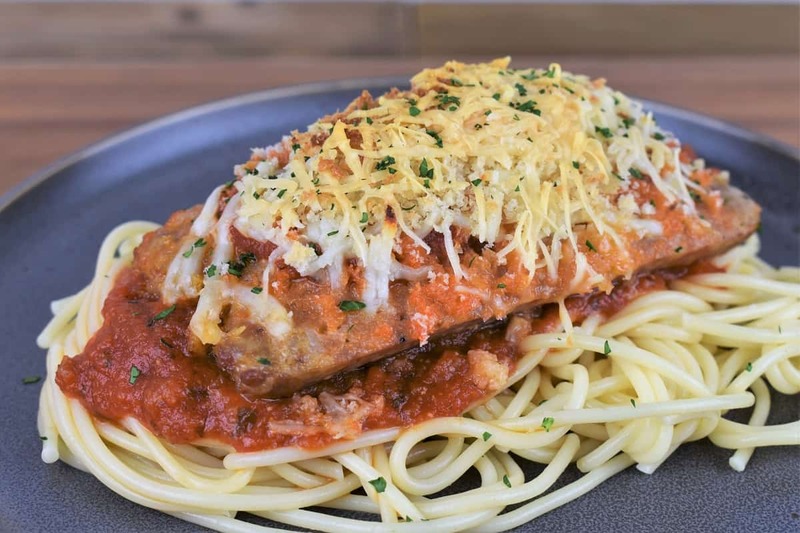 ​Serve the Italian sausage parmigiana on a bed of sauced spaghetti. Carefully add 1 cup of water to the skillet, lower the heat to medium-low and cover. Cook the sausage for approximately 15-20 minutes or until the internal temperature of the Italian sausage is at least 165°F. Give the pan a quick shake every once in a while, or turn the sausage to make sure they don't burn. Allow the sausage to cool on a plate or cutting board. Spoon about 1 tbsp. of the pasta sauce over each sausage. Sprinkle the sauce with the garlic powder and dried oregano. Top each sausage with 1-2 tbsp. of the crunchy panko breadcrumbs. Finally, sprinkle the top with a little Parmesan cheese. Once the Italian sausage parmigiana is prepped, drop the pasta into the boiling water. Make sure you add a generous amount of salt to the pot. Cook the pasta to package directions for al-dente. Warm the sauce for the pasta. Place the sausage in the oven, bake for 15 minutes or so until the cheese is melted. 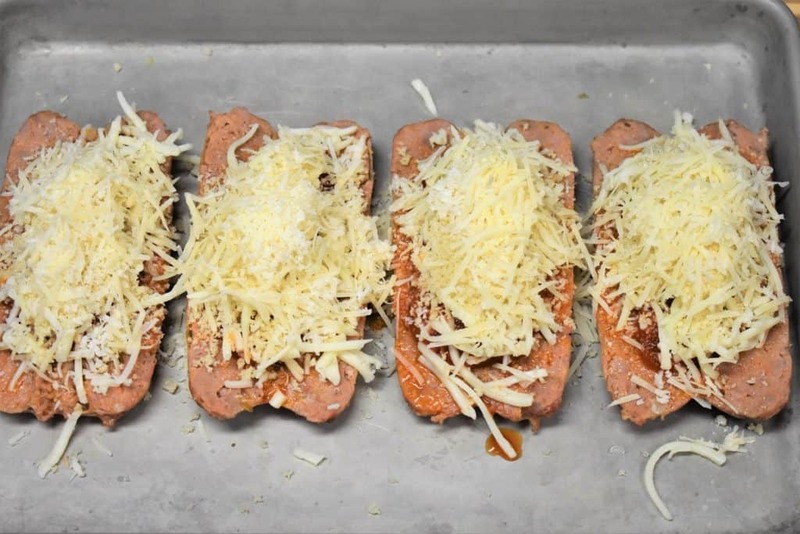 If desired switch the oven to broil for a couple of minutes to toast the breadcrumbs and brown the cheese a bit. If you decide to do this, do not leave the oven’s side. The Italian sausage parmigiana can go from beautifully golden to burnt in a minute! Switch the oven light on and stay put. As soon as the top is perfectly golden, remove the baking sheet from the oven. Garnish with the parsley, if desired. When the pasta is done, reserve about a ½ cup of pasta cooking water, drain the pasta and return it to the pot. Add the reserved pasta water to the spaghetti to prevent it from sticking, give it a good stir. 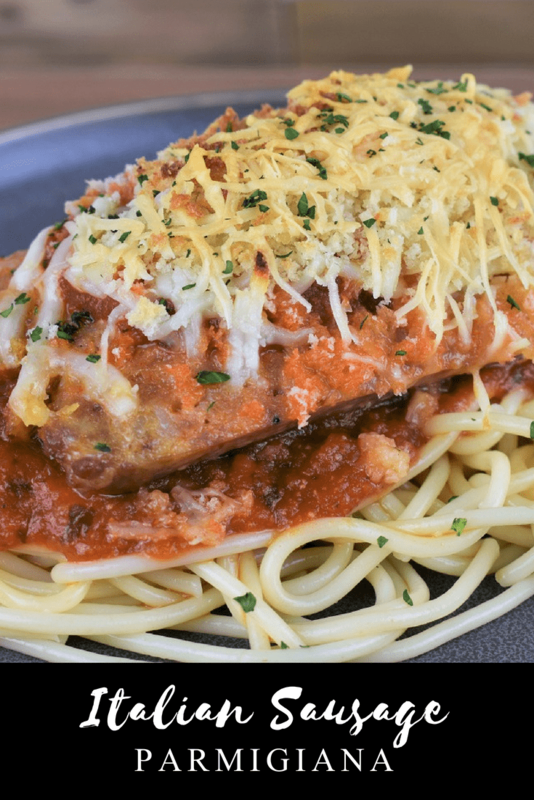 Serve the Italian sausage parmigiana on a bed of sauced spaghetti.